Qing Li is a Professor at the Department of Computer Science, City University of Hong Kong where he joined as a faculty member since Sept 1998. Prior to that, he has taught at the Hong Kong Polytechnic University, the Hong Kong University of Science and Technology and the Australian National University (Canberra, Australia). 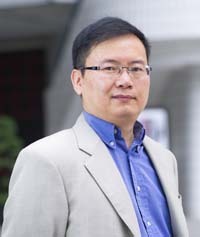 Prof. Li has served as a consultant to Microsoft Research Asia (Beijing, China), Motorola Global Computing and Telecommunications Division (Tianjin Regional Operations Center), and the Division of Information Technology, Commonwealth Scientific and Industrial Research Organization (CSIRO) in Australia. He is/was a Guest Professor of the University of Science and Technology of China (USTC) and Zhong Shan (Sun Yat-Sen) University, a Visiting Professor of the Institute of Computing Technology (Knowledge Grid), Chinese Academy of Science (Beijing, China), and an Adjunct Professor of the Huazhong University of Science and Technology and the Hunan University (Changsha, China) where he got his BEng.degree from the Department of Computer Science in 1982. He is also a Guest Professor (Software Technology) of the Zhejiang University (Hangzhou, China) -- the leading university of the Zhejiang province where he was born. Prof. Li has been actively involved in the research community by serving as an editor and reviewer for technical journals, and as an organizer/co-organizer of numerous international conferences. Some recent conferences in which he is playing or has played major roles include WAIM2012, CoopIS2011, WAIM2010, DASFAA2010, APWeb-WAIM'09, ER'08, WISE'07, ICWL'06, HSI'05, WAIM'04, IDEAS'03,VLDB'02, PAKDD'01, IFIP 2.6 Working Conference on Database Semantics (DS-9), IDS'00, and WISE'00. In addition, he served as a programme committee member for over fifty international conferences (including VLDB, ICDE, WWW, ER, CIKM, CAiSE, DASFAA, CoopIS, and FODO). He is currently a Fellow of IET (formerly IEE), a Senior Member of IEEE, a member of ACM-SIGMOD and IEEE Technical Committee on Data Engineering. He is the Chairperson of the Hong Kong Web Society, and also served/is serving as an executive committee (EXCO) member of IEEE-Hong Kong Computer Chapter and ACM Hong Kong Chapter. In addition, he serves as a councilor of the Database Society of Chinese Computer Federation, a councilor of the Computer Animation and Digital Entertainment Chapter of Chinese Computer Imaging and Graphics Society, and is a Steering Committee member of DASFAA, ICWL, and the international WISE Society.